Customised plastic motor cooling fan of top notch quality. Our organization is an eminent manufacturer of Motor Cooling Fans. These find wide usage in different electrical appliances and motorized impellers for exhaust applications. Owing to their precision design and compact size, these motors require minimum space and provide vibration free operation. 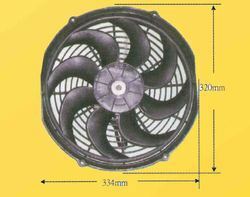 We customize these fans as per the requirements of the clients. - We manufacture best of Motor-Cooling Fan Coal in market. Accredited amongst the remarkable business names, we are highly instrumental in providing a supreme quality assortment of Electric Motor Cooling Fan to our respected customers.